Here at Medlin Famiy Farm we have multiple options for Gem Mining! We make it easy, convenient, fun, and affordable for any budget. Listed below are our 3 option plans you can choose from. If you have further questions about Gem Mining, please feel free to give us a call or e-mail. Option #1: We make it easy and can save you the hassle of a drive! We can bring our mobile gem mining trailer to your location with two instructors to help with this fun, adventurous activity. 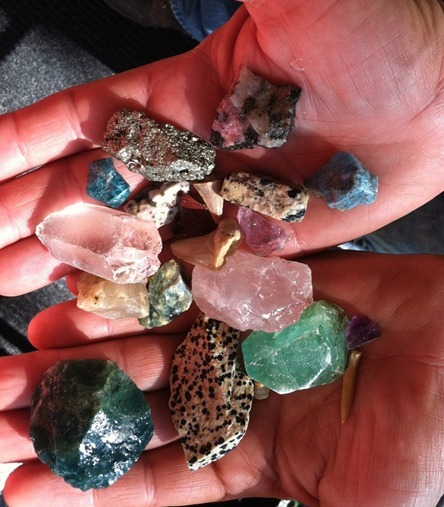 All mining rough bags will contain 12- 16 gemstones/fossils to sift through and find. After finding all your treasures and seeing them shine brightly in the water, we will have a table set up with a chart to help everyone identify what they have found! And of course everyone will get to keep whatever they find! The price for this option is $8.50 per bag, but we do require a minimum of 40 people participating in the activity. Option # 2: Of course you can always come to the farm to find your treasures. When visiting the farm our gem mining option is a popular activity! You will be able to sift through your own bag of mining rough and find 12-16 gemstones/fossils! Keep everything you find and get to identify all your treasures at our identification booth. This "on the farm option" is $4.00 extra per bag with the purchase of your entrance to the Farm during the fall season. If you would like to get your bags here to take home you can do that as well at the same price. Option #3: This option is our most budget friendly. With this option each bag contains 6 gemstones/fossils to find in the mining rough. We offer a special kit that is ONLY $130 which includes 30 bags of mining rough to sift through, two trays to catch all the mining rough, and two light weight sifters that are easy for the little ones to handle. We will include 30 brightly colored bags that you can store your beautiful treasures in! We will offer the small bags without the kit for only $3.50 each.